As Private Practice Season 6 heads towards a conclusion, and with it a conclusion to the series overall, Shonda Rhimes is pulling out all the unusual stops. This week, that meant a Sam-based episode that didn't sit especially well with our critic. 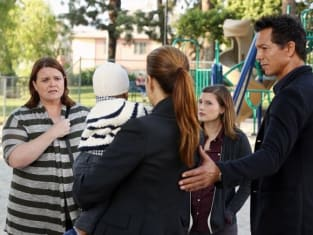 Next week, meanwhile, it means we're in for a seriously emotional hour, as Addison takes center stage when Henry's biological mother shows up and causes major problems for our favorite new parent. How will she react when this woman asks to be more involved in her son's life? Watch the official ABC teaser to get an early look at "Apron Strings."